Sections Why change your default settings? 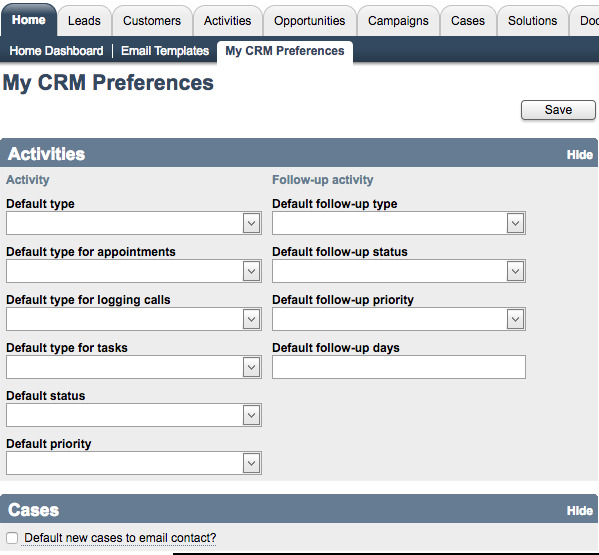 CRM preferences allow you to set defaults settings that apply to Activities and Cases in your CRM. The defaults set on this screen only affect the user signed in. Defaults for other users can be set when those users sign in. Setting your default settings to match your workflow saves time and helps you to personalize your Method experience. For example, if your business has very few in-person meetings but a lot of phone calls, you can make phone calls your default activity type. From your Method dashboard, click Home > My CRM Preferences. Choose the field you wish to change the default for, and select the desired option. If you wish to change the Default follow up days, you must type in a numerical value (e.g. 1, 17, 22). Once you have made your desired changes, click Save. The following is the list of defaults you can set in your CRM preferences. For more information on activities, click here. Default type: The default activity type on the New Activity screen. Method uses "other" if no default is selected. For more information on activity types, click here. Default type for appointments: The default activity type on the New Appointments screen. Method uses "Meeting" if no default is selected. Default type for logging calls: The default activity type on the Log Call screen. Method uses "Phone Call Incoming" if no default is selected. Default type for tasks: The default activity type on the New Task screen. Method uses "To-do" if no default is selected. Default status: The default activity status on the New Activity, New Appointment, New Task, and Log Call screens. Method uses "Not started" if no default is selected. For more information on activity statuses, click here. Default priority: The default activity priority on the New Activity, New Appointment, New Task, and Log Call screens. Method uses "2-Medium" if no default is selected. For more information on activity priorities, click here. For more information on follow-up activities, click here. Default follow-up type: The default activity type on the Follow-up screen. Method uses "other" if no default is selected. Default follow-up status: The default activity status on the Follow-up screen. Method uses "Not Started" if no default is selected. Default follow-up priority: The default activity priority the Follow-up screen. Method uses "2-Medium" if no default is selected. Default follow-up days: How many days in the future your default follow-up occurs. Method uses "7" if no default is selected. This option lets you set a default for Cases. If you check this option, by default an email notification is sent to the contact assigned to the case. For more information on cases, please click here.